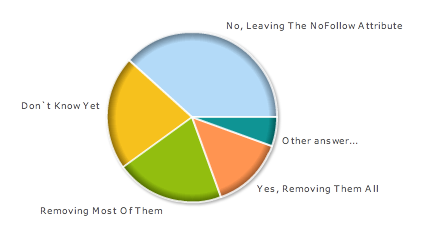 A few weeks ago, we ran a poll asking Will You Remove The NoFollow Attributes From Your Pages? Why did we ask SEOs and webmasters this question? With the recent update from Google on how they handle the nofollow'ed links, many SEOs had to revisit if they would continue to use them or not. So I figured I would poll the readers here and see what they plan on doing. We received just under 300 responses. Question: Will You Remove The NoFollow Attributes From Your Pages? Most of the "other" answers are in the form of, "I never used the nofollow in the first place."